This sidewall, manufactured by Ben Rose Inc., was made to cover the majority of the main wall area, between the chair rail and frieze. Groves was screen-printed in 1955, and depicts silhouettes of leafless trees. Screen-printing entails using a large mesh screen, with each separated design layer printed one after the other by hand on a long table. The mesh screen is placed face down on the paper, and ink is applied to the back of the screen. The ink is drawn across with a smooth rubber blade and pushed through the mesh. This process is repeated until all of the layers of the design are completed. The use of both light and dark green tones in the screen-print creates a successful shadowlike effect. It also gives the wallpaper a believable sense of depth. I imagine that the repetitive bands of linear imagery of this sidewall would form a busy and stimulating image. 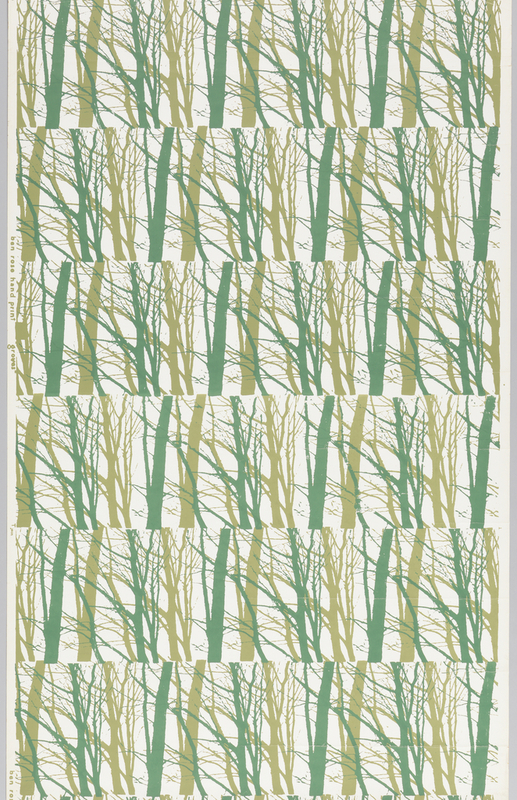 This engaging pattern was typical of Ben Rose’s wallpapers, which were known as epitomizing the enthusiasm and confidence of the post-war era. Ben Rose Inc. was established in 1946 when Ben Rose set up equipment to hand screen-print both textiles and wallpapers. Ben Rose’s early career as a painter heavily influenced his wallpaper and textile patterns, which were typically inspired by motifs from the natural world, science, and art. Emily FitzGerald is a student in the History of Decorative Arts & Design graduate Program at the Cooper Hewitt, and is a Master’s Fellow in the Wallcoverings Department. Sidewall, Groves, 1960–67. screen printed on vinyl. 1969-104-5-b.